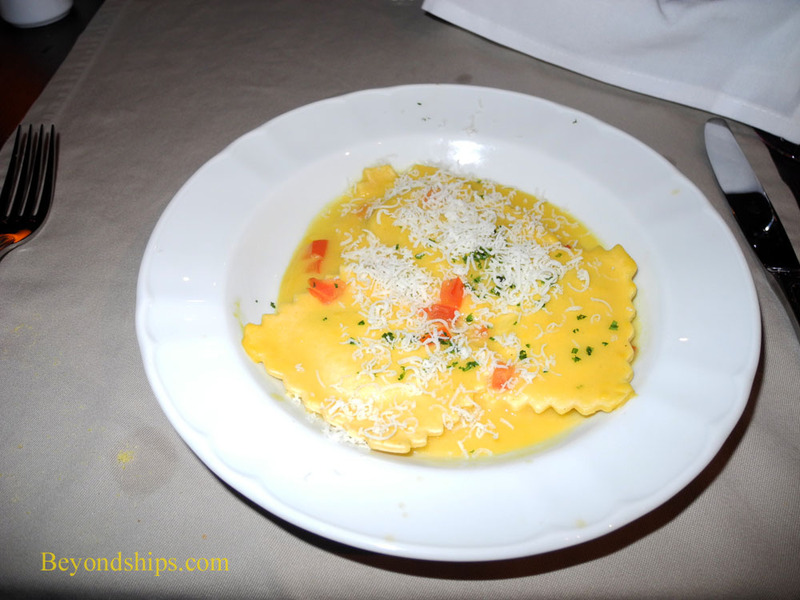 For many years, Royal Caribbean's Italian specialty restaurant was Portofino, an Italian fine dining concept similar to the Sabatini restaurants on the Princess cruise ships. With the coming of Oasis of the Seas, Royal introduced a new Italian specialty restaurant Giovanni's Table, a more informal trattoria-style venue. 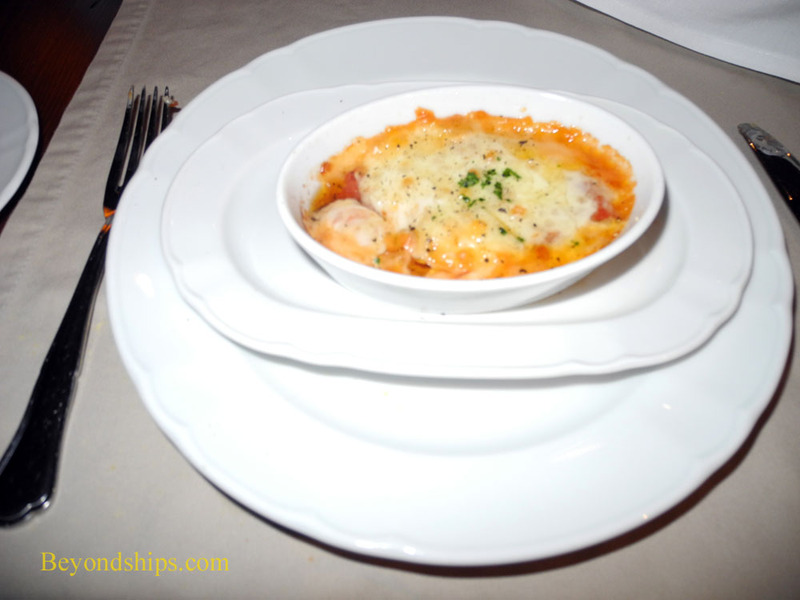 The success of this concept on Oasis and on her sister ship Allure of the Seas has led Royal to roll out Giovanni's through the Royal Caribbean fleet replacing the existing Portofino restaurants. On Brilliance of the Seas, Giovanni's Table has replaced Portofino not only in concept but physically. 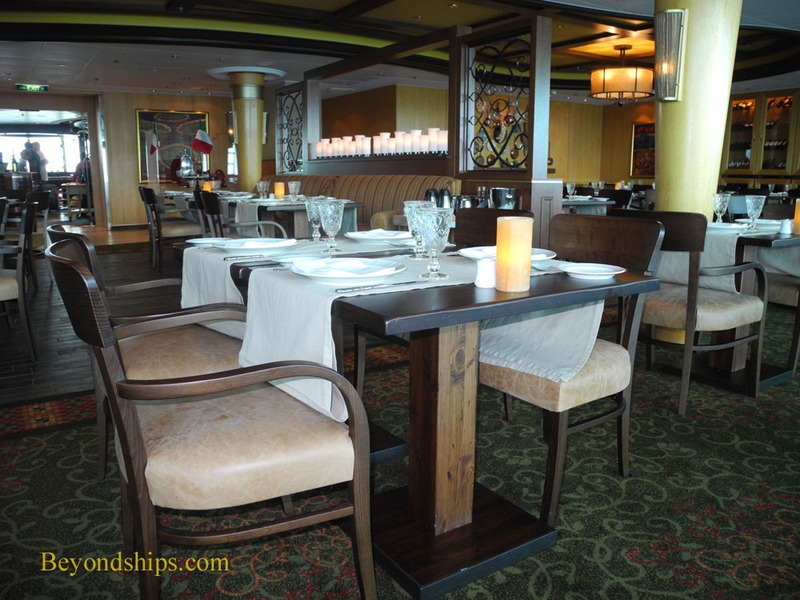 Giovanni's is located in the space once occupied by Portofino on Deck 6 just outside the Schooner Bar. The room has been given a new, more relaxed look including a display of kitchen utensils on one wall and planters with colorful blooming flowers along the wall with the floor-to-ceiling windows. Full table cloths have been replaced with cloth coverings that leave a substantial part of the wood tables exposed. At the same time, the light wood wall paneling that helped to make Portofino's a bright vibrant room has been retained. The menu at Giovanni's focuses on popular Italian favorites. However, these are not massed produced assembly-line items. Rather each dish that we tried had the taste of dishes prepared ala minute. Two examples stand out. The eggplant parmigiana, which is served as an appetizer, arrived in its own individual-size casserole dish. It was hot from the oven but the flavor had not been cooked out of the vegetables - - a problem that often mars this dish. 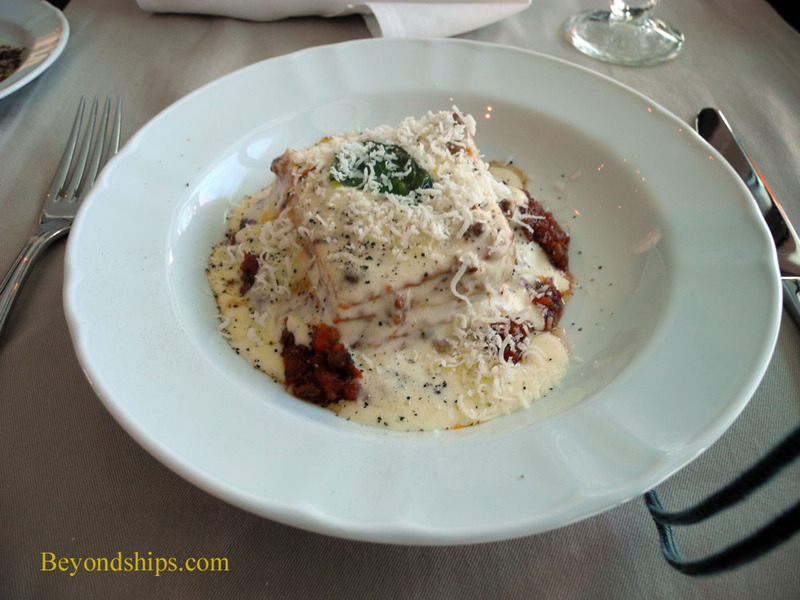 Similarly, the meat lasagna, a selection found in the pasta section of the lunch menu, was an individually-prepared portion, not something cut out of a larger dish. It was creamy and the saltiness of the cheese contrasted delightfully with the ground beef. The steak on the lunch menu, an eight ounce strip loin arrived cooked exactly as ordered. Again, the flavor of the beef contrasted beautifully with the tangy Gorgonzola butter. Also, the garlic fries were unusually flavorful, no need for catchup here. Similarly, the steak on the dinner menu, an eight ounce tenderloin, arrived nicely prepared. Its flavor was less bold than the lunch version, a more subtle contrast with the sauce. 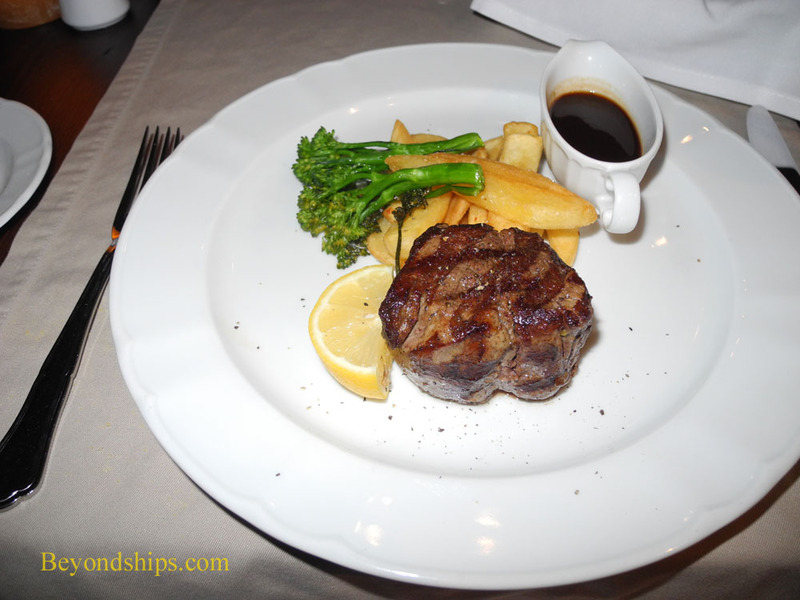 On both occasions we visited Giovanni's, the service was attentive and friendly. The waiters made recommendations as to each course, which is a hallmark of good service. For dessert, the servers recommended the Tiramisu alla Giovanni. The popularity of tiramisu has made the dish almost a cliché and unfortunately these days, it is often a disappointment. However, this tiramisu was moist and flavorful with a healthy taste of coffee liqueur. 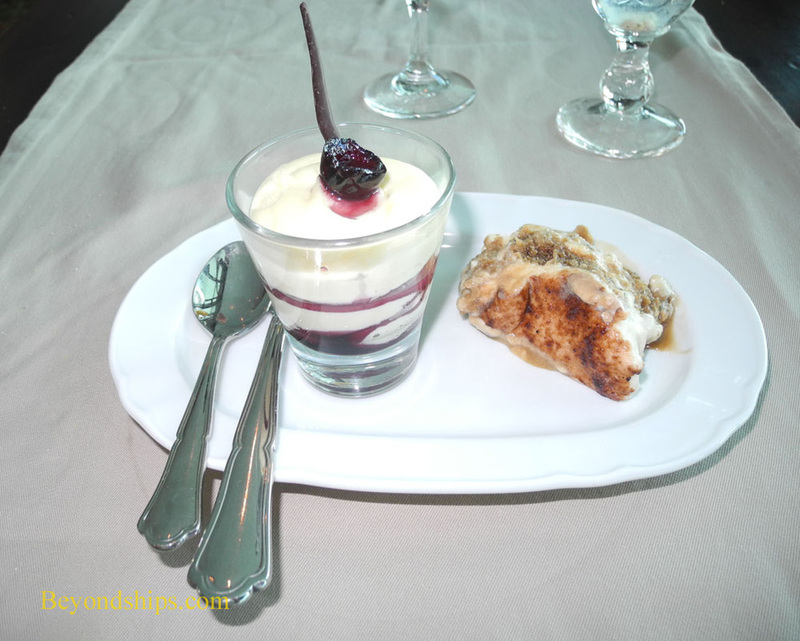 It was much more impressive than the Crema all' Amarena in which the creamy custard overwhelmed the flavor of the cherries. Giovanni's Table is open for lunch on sea days for which there is a $15 cover charge. 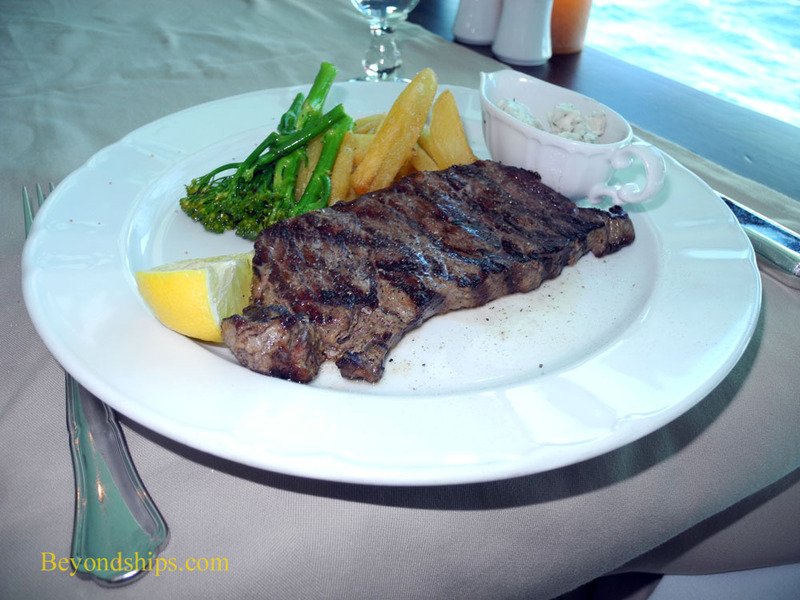 It is also open for dinner each night of the cruise. The cover charge for dinner is $20. Above: The strip loin from the lunch menu. Below: The tenderloin from the dinner menu.